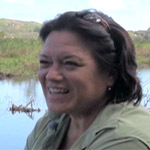 Meleanna Meyer (2012), is an esteemed Hawaiian artist, filmmaker, and arts educator. She studied in France and Italy, receiving her BA in Design-Photography from Stanford University and her MA in Educational Foundations from the University of Hawaii at Manoa. Whether designing art curricula, classes, or workshops for students, faculty, or community members, Meleanna helps people find their voice through the visual arts. Committed to social justice issues, she has traveled extensively through Oceania and Europe, with a recent visit to Palestine. 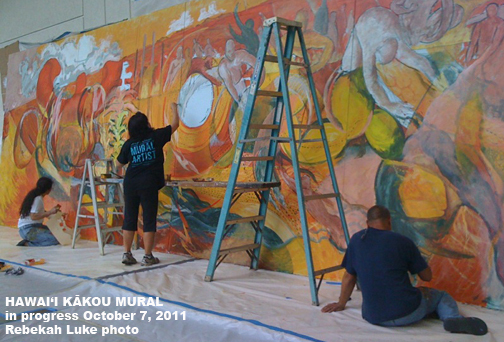 In 2011, she headed the Hawaii Kakou mural project–a collaboration of 5 Hawaiian professional artists and 23 students. The mural’s theme of “New Old Wisdom” reflects Native Hawaiian perspectives which created integrated and sustainable economies rather than a capitalist political-economic system. The 10′ x 64′ mural can be found on the ground floor of the Hawaii Convention Center in Honolulu. Currently, she is working her third film, Kuu Aina Aloha: Beloved Land, Beloved Country, part of a documentary including Puamana (1991) and Hookuikahi: To Unify as One (1998). The Journey to Justice interview took place at Kawainui Marsh, near Kailua town on the island of Oahu. Meyer is an active participant in the restoration of the marsh. I began the interview by asking Meyer where she was born and raised. Running time: approx. 38 minutes.